Acoma Pueblo is a community built on top of a mesa in the Rio Grande Valley. At the end of the 16th century it was an area of tension between the Pueblo people and the conquering Spanish. Spanish settlers hoped to claim the lands for the Spanish crown, but were unsuccessful in penetrating the natural stronghold that was Acoma. Then, in 1595, the Acoma people decided to give Juan de Oñate, soon to be the first governor of Nuevo Mexico, food and provisions for his group of explorers and settlers. Later, the nephew of Oñate, Juan de Zaldívar, returned and attempted to take provisions, and women, by force. Zaldívar fell to his death during the struggle, and in retaliation, in January 1599, Oñate took the pueblo by siege. This battle led to the massacre of 800 - 1,000 Acoma people, and the survivors were either mutilated, by having a foot cut off, or sold into slavery for a period to extend beyond 20 years. A later trial found Oñate's behavior to be cruel and severe beyond the parameters of his duty as a representative of the King of Spain, and he returned to Spain after being stripped of the land, title, and wealth he had attempted to accrue at the northern edge of the New Spanish Empire. 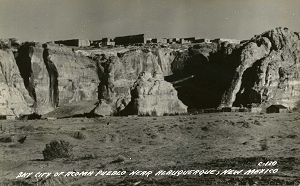 "Acoma Pueblo New Mexico postcard, circa 1930" by uploaded by born1945 is licensed under CC BY. 2014 Acoma Massacre. The American Mosaic: The American Indian Experience. 2005 Acoma Pueblo Resistance. Encyclopedia of Native American Wars and Warfare. Robert Wooster, ed. New York: Facts On File, Inc.